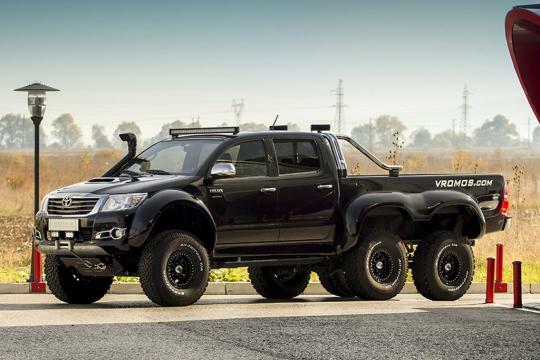 Vromos started with a stock double cab Hilux and added a few extra feet to the frame, an extra axle, and custom-built cargo bed. Not content with merely stretching the truck, the company also gave it a generous lift kit, a snorkel, huge fender flares, as well as all-terrain tires. A winch and beefy skid plates help enhance the truck's off-road prowess. While the exterior and the mechanical components are all business, the cabin was built with an unabashed focus on luxury. 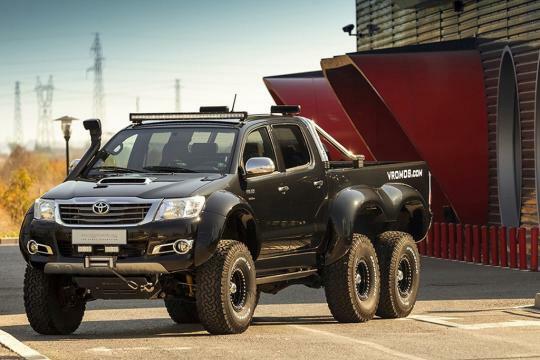 Another Bulgarian firm called Overdrive has masked the Hilux's utilitarian roots by fitting wall-to-wall leather upholstery, Alcantara accents, and front seats out borrowed from the Land Cruiser. While Vromos hasn't published technical specifications, the fact that the truck is equipped with an automatic transmission suggest it's powered by a 3.0-liter four-cylinder turbodiesel engine that makes 171 horsepower at 3,600 rpm and 265 lb-ft. of torque from 1,400 to 3,200 rpm. The less powerful 2.4-liter oil-burner that the Euro-spec Hilux is offered with is exclusively offered with a manual transmission. Vromos hasn't revealed whether the six-wheeled Hilux is a preview of a limited-edition model or simply a one-off. buying to mount an anti aircraft gun now!!!!!!!!!!!!!!!!! Haha i was gonna page you.